In clinical environments where care teams must deal with pain and illness, death, and conflict on a daily basis, chronic stress, compassion fatigue and burnout can run rampant. Care teams who are unable to renew their personal emotional resources are likely to develop apathy, become dissatisfied with their work, and suffer in both personal and professional relationships. Healthcare organisations need a new aim that improves patient-centred care, efficiency and population health while also restoring joy to the practice of medicine. Vocera Chief Medical Officer Bridget Duffy, MD discusses the latest research and application of compassion in healthcare at Stanford’s The Science of Compassion conference. 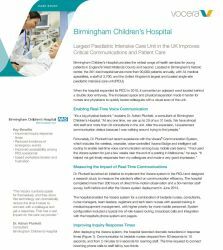 Birmingham Children’s Hospital serves more than 90,000 patients annually, with 34 medical specialties, a staff of 3,700, and the United Kingdom’s largest and busiest single-site paediatric intensive care unit (PICU). Code Lavender is a formalised, rapid response program designed to provide emotional support to staff members during times of high stress or loss. When a stressful event occurs, doctors and staff may call upon a Code Lavender team, typically comprised of palliative care, social work, pastoral care, organisational leaders, or other support services, for resources and support. Leading healthcare organizations recognize that the only way to chart a course to long-term, sustainable growth is to create market differentiate based on the human experience they deliver to patients and families, and the support they provide to physicians, nurses and staff.